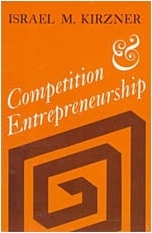 We are reading Israel Kirzner's Competition and Entrepreneurship (1973). There are six sessions scheduled for this semester and there are six chapters. (That was just fortunate.) The first chapter "Market Process versus Market Equilibrium" was this week's focus. I found that I needed to remind myself several times that this is only the introductory chapter. There are a number of points that need further clarification and refinement, but Kirzner doesn't (and shouldn't) go into an in depth explanation in the introductory chapter. The next point that I needed to remind myself was who the target audience was for Kizner. Professor Cordato gave a brief overview of the state of the profession in 1973. This was a time when General Equilibrium (price) theory reigned supreme and that all firms were either perfectly or imperfectly competitive. So the target of this book is not me. I was "raised" Austrian. I was taught from the beginning competition is a verb and not a noun. The target of the book is obviously not those professors who are locked into their ways. Then who is the target? My guess is that the targets are graduate students in economics. They are still forming their opinions on which school is correct and will be more open-minded about the different approaches. Kirzner sees the profession completely focused on equilibrium. The dominant view is that we should be in equilibrium and, if reality differs from it, then there is an imperfection that needs to be studied and corrected (usually by government). Kirzner suggests that there is an alternative. Competition should not be studied as a state of being, for example, "the XYZ Market is in a state of perfect competition." Rather the normal, vernacular, usage of "competition" as a rivalrous process should be adopted. Competition is a verb and not a state of being. Therefore, equilibrium, while an important tool, should not be the focus of the economist. Instead the questions of "Why is there a change in prices?" and "What are the forces behind the price changes?" should dominate the economist's thinking. Economists too often use phrases such as "market forces" to describe the market process. "Market Forces" move the market to equilibrium. Professor Margolis challenged the group by asking us to describe exactly what we mean by "market forces"? He stated that we all like to tell a story that illustrates an example of market forces, but we tend to leave "market forces" as a fuzzy concept. My thoughts are that it is shorthand for explaining how individuals have some sort of "felt uneasiness" (to use Mises' phrase) and think about how they can replace that state for a better one. Then they act. Within this analysis we are implicitly assuming time and ignorance (to use the title from Rizzo and O'Driscoll's book). As buyers and sellers enter into the market they bring with them knowledge. As the desires of the buyers confront scarcity, a price is generated and ignorance is lessened. It is in this step-by-step manner that the market will equilibrate. Contained in this notion is an implicit ceteris paribus assumption. We need to realize that tastes, preferences, expectations, etc. need to be held constant. When we (economists using this thought experiment) start to relax the ceteris paribus assumption, we are allowing supply and demand to change and thus equilibrium prices and quantities change. Despite the fact that the equilibrium point (intersection of supply and demand curves) changes, the market forces are chasing that point around. So while equilibrium is an important theoretical concept, we might never, ever be in equilibrium. The important concept to focus on is that competition is always driving us toward equilibrium. These driving forces then require the interaction of individuals with limited knowledge. They require that this process takes time, meaning that we do not simply jump from equilibrium point to equilibrium point. Finally, this is not an automatic or mechanical process; it requires actual people to move the market. That person is called the entrepreneur. We argued about the implications of the pure entrepreneur. A traditional manner of characterizing the Kirznerian entrepreneur is someone stumbles across money lying on the ground. (If this is the case, then my son is a Kirznerian entrepreneur because he found 12-cents on the ground today!) However, the act of picking up the money is a physical act and thus is not a pure entrepreneur. After much discussion, the consensus of the group was that the pure entrepreneur is an observer and accumulates knowledge. The action is separate and distinct. An interesting question was raised and so I'll throw it out to you to ponder and comment... "Is an entrepreneur only a person who finds Pareto Superior moves?" The last issue that we discussed was the point on resource monopoly. While he defines most monopolies are a "barrier to entry" problem, Kirzner argues that resource monopolies are "very real and significant." In other words, a single owner of a resource can be a monopolist and this has consequences that are "very real and significant." I disagree. Rothbard disagrees. In fact most of the people in the room disagreed. (Some didn't vocalize one way or another, which was fine.) We thought about who else (Austrian) thinks that a single resource owner is a real and significant problem, and the only one that anyone could think of is Sandy Ikeda, at SUNY - Purchase. I like Sandy and he is usually fairly solid in his economics so I will have to ask him about this point. Furthermore, this is still just the first chapter and there is a whole chapter on monopolies coming up and so we will see how "real and significant" this problem really is. Unfortunately, we ran out of time and closed the meeting there. If you are reading along (or even if you aren't) please feel free to post your comments and continue the discussion. i want to join you! when is the 2nd meeting time? For the Fall semester, we have 6 scheduled meetings starting on 4:30pm in Nelson Hall, Rm 3220. I don't know if the next meeting has been formally announced, but I believe it is Sept. 16, 2011.